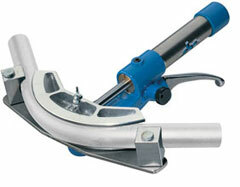 OB85/S hydraulic pipe bender is the samllest in its range of machines and also the easiest to handle. 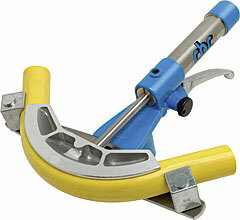 It is very powerful and is able to bend big diameter pipe with the minimum effort. 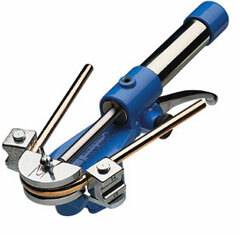 These benders allow counterform quick coupling with a simple pressure, without using screws or bolts. Special equipment (former + counterformer) to execute overrunnings of multi-coated pipes for the diam.16-20-26 and of copper pipes for the diam. 16 and 18. It can be fitted also on benders type OB/85S, OB2003 and MC 2005. 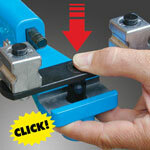 Plastic case for versions A-B-C-D-E for bending from 10 mm up to 26 mm. Plastic case for version F for bending from 10 mm up to 32 mm. 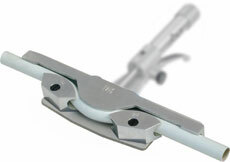 Plastic case for versions G-H-I for bending from 14 mm up to 32 mm. The portable hydraulic bender OB/85S is the ideal tool even to bend copper pipes specially coated by a special PE covering , made specifically for the passage of liquid and/or gaseous fuels up to diam. 22 mm.